Old-school adventure games have staged somewhat of a comeback in recent years, but recreating the feel of classic franchises like Monkey Island, Sam & Max, and King’s Quest has proven to be an elusive challenge. For every new success, like Ron Gilbert’s Thimbleweed Park, it seems there’s a disappointment, like Tim Schafer’s barely coherent Broken Age. The Low Road takes place during the 1970s in a slightly off-kilter alternate reality where car companies all maintain well-staffed espionage divisions to keep ahead of the competition. I’m sure there really was all sorts of sleazy corporate spy stuff going on in the 70s, but I don’t think it quite worked like this. Players take on the role of Noomi Kovacs, a rookie agent who dreams of daring James Bond adventures, but sadly discovers corporate spycraft mostly involves phishing secrets out of people over the phone. Noomi isn’t the type to settle, so she manipulates her way into a field mission with her boss Barney Turner (aka “Turn”). The two have to find and rescue a kidnapped engineer, but along the way they uncover some troubling, potentially world-altering, secrets. Like the best point ‘n’ clickers, The Low Road plunges you into its unique universe without a lot of introduction. You organically figure out what’s going on as you play, which helps you forge a connection with the world. 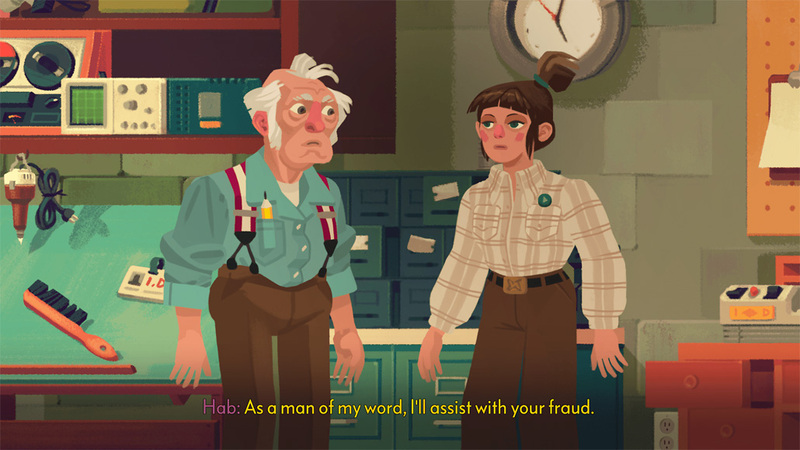 Noomi is your classic adventure game protagonist – awkward, sarcastic, and a bit of a sneak, but essentially decent. She’s basically a spunky lady Guybrush Threepwood. She may get on your nerves a bit at first, but she’ll grow on you, as will most of the rest of the cast (with the exception of a couple intentionally-annoying characters). The Low Road’s writing is generally top notch – snappy, funny, and not overly longwinded. The story takes a few fun left turns en route to a satisfying final chapter that could stand alongside some of the best finales in adventure game history. That may sound like excessive praise, but it’s true. 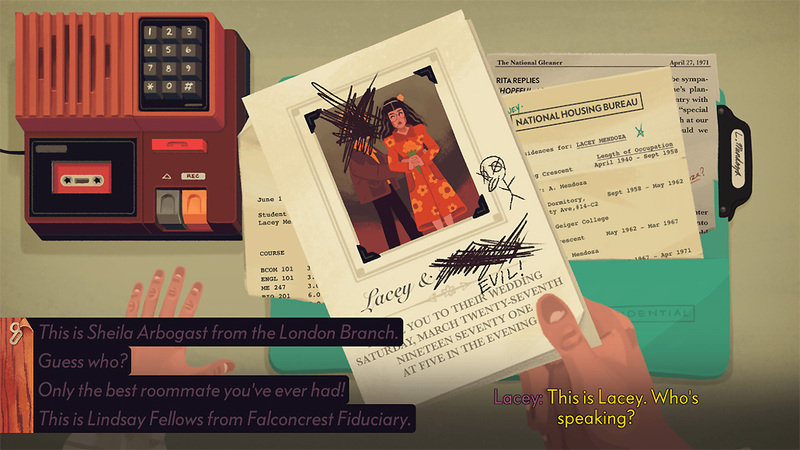 I’ve played a ton of adventure games, and a lot of them drop the ball in the final act – The Low Road doesn’t. Related Yesterday Origins Review – Who Wants to Live Forever? The Low Road elevates its writing with surprisingly excellent voice acting. The game’s hip 70s-psychedelia-inspired score is also well-done – there are a lot of big budget games out there that don’t sound half as good as this scrappy indie. The Low Road’s visuals aren’t quite as impressive – the game has an appealing picture book look, but characters move in an awkward, robotic way. It’s a bit of a shame, as it feels like the game’s quality character designs deserve better. So, The Low Road spins a good yarn, but does it play well? I haven’t tried the PC version of the game, but basic controls feel a bit clunky on Nintendo Switch. As you walk around a stage, areas and items you can interact with are darkened slightly, but the effect is so subtle it can be easy to miss things. Also, there were definitely instances when important items of interest simply weren’t highlighted. Thankfully, you can cycle through all the important hotspots in your immediate vicinity with the right control stick, but even that can be a bit finicky. 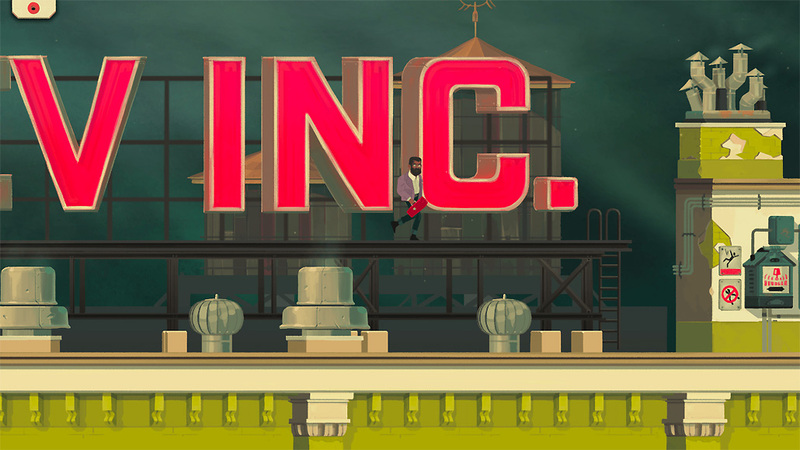 These control issues aren’t a huge deal, as this is a relaxed, story-driven game, but it is disappointing when the clicking in a point ‘n’ click game doesn’t feel great. Thankfully, once you get used to The Low Road’s basic handling, you’ll find the game serves up some pretty solid puzzles. Of course, there’s plenty of traditional “rub random inventory items on things to proceed” stuff. Most of these puzzles follow their own odd internal logic – for example, in order to get promoted to field agent, you have to get the entire rest of the office to quit, which you do by printing off job fliers with special invisible ink that only disappears when it’s warm, breaking the air conditioning, then sneaking the “blank” papers past your bosses. Sure, okay! The game generally does a good job of dropping just enough hints to make sure the inventory puzzles aren’t totally indecipherable, without outright giving the answers away. The Low Road also has a number of unique first-person puzzle sequences. 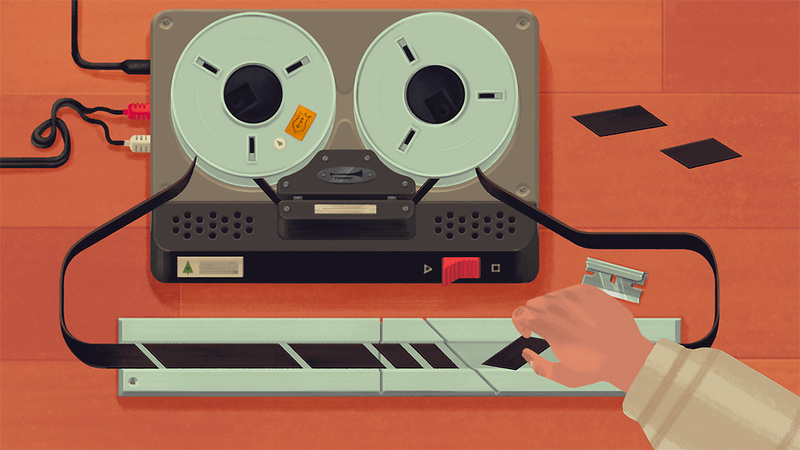 These range from simple brainteasers, to more unique challenges, like having to splice together phony audio recordings or picking somebody’s pocket under a tight time limit. The best of these puzzles are actually the phone phishing sequences – you’re given a dossier on somebody and it’s up to you to use the sensitive info contained within to coax the truth out of them. These scenes are clever, challenging, and more engaging than you’d expect rifling through scraps of paper and navigating dialogue options to be. I kind of wish The Low Road had more of these phone puzzles (there’s only two of them), but I suppose the novelty might have worn thin if they popped up more frequently. The Low Road is around 4 to 5 hours long, which is a decent length for an old-school adventure game and a solid value for $15. There isn’t really any reason to replay the game, but it provides a satisfying, complete story. Like a good spy, The Low Road gets out before it overstays its welcome. This review was based on a Nintendo Switch copy of The Low Road provided by publisher XGen Studios.